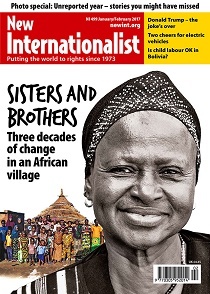 In the January-February 2017 issue of New Internationalist Chris Brazier completes a unique journalistic project by returning to the village in Burkina Faso, in west Africa, that he first visited in 1985 while making a film. He visited in 1995 and 2005 to report on changes in the lives of individuals and on the progress of development in the community. The previous magazines have offered an intriguing insight into the lives of people battling against poverty and have reported on substantial positive changes in the life of the community – from the opening of a health centre and a primary school in the village to the first appearance of mobile phones. Have the past 11 years of change brought further progress? And are the individuals that we have tracked over the three decades still healthy and happy?